Parkinson's disease is the most common movement disorder characterized by dopaminergic dysfunction and degeneration. Loss-of-function mutations in the DJ-1 gene have been linked to autosomal recessive forms of early-onset familial Parkinson's disease. DJ-1 is thought to play roles in protection of cells against oxidative stress and in maintenance of the normal dopaminergic function in the nigrostriatal pathway. Here we investigate the consequence of both DJ-1 inactivation and aging in mice. We found that DJ-1-/- mice at the age of 24–27 months have normal numbers of dopaminergic neurons in the substantia nigra and normal levels of dopamine and its major metabolites in the striatum. The number of noradrenergic neurons in the locus coeruleus is also unchanged in DJ-1-/- mice. Moreover, there is no accumulation of oxidative damage or inclusion bodies in aged DJ-1-/- brains. Together, these results indicate that loss of DJ-1 function alone is insufficient to cause nigral degeneration and oxidative damage in the life span of mice. Parkinson's disease (PD) is an age-related movement disorder characterized clinically by bradykinesia, rigidity, resting tremor and postural instability, and neuropathologically by the selective loss of dopaminergic (DA) neurons and the presence of Lewy bodies in the substantia nigra (SN). Although most PD cases are sporadic, mutations in parkin (PARK2), PINK1 (PARK6), and DJ-1 (PARK7) have been linked to recessively inherited forms of parkinsonism, which resemble idiopathic PD clinically [1–3]. To investigate how DJ-1 deficiency causes PD, we have previously generated a mouse model bearing a targeted germline disruption of DJ-1, and our multidisciplinary analysis has uncovered an essential role for DJ-1 in DA physiology and dopamine D2 receptor-mediated functions . Besides the importance of DJ-1 in DA neurotransmission and signaling, DJ-1 has been reported to have multiple functions associated with PD pathogenesis. First, several cysteine residues in DJ-1 can be oxidized in response to oxidative stress, and wild-type but not mutant DJ-1 protects cells from oxidative stress [5–11]. Furthermore, DJ-1 has been shown to stabilize the antioxidant transcription master regulator Nrf2 (nuclear factor erythroid 2-related factor) . Second, DJ-1 has chaperone activity and inhibits α-synuclein aggregation, which is thought to be a key event in Lewy body formation . Third, it has been suggested that DJ-1 might be involved in transcriptional regulation of neuroprotective or anti-apoptotic genes . DA neurons are likely to be exposed to increased levels of oxidative stress caused by the metabolic products of dopamine in comparison to other types of neurons in the brain. It is thought that reactive oxygen species (ROS) oxidizes lipids, proteins and nucleic acids, resulting in cellular dysfunction or death [15, 16]. Evidence has shown that products of lipid, protein and DNA oxidation accumulate in PD brains [17, 18]. It has been shown that levels of DJ-1 protein are significantly increased in PD brains and cerebrospinal fluids, and DJ-1 is oxidatively damaged in the brains of patients with sporadic PD [19–21]. Therefore, it has been hypothesized that DJ-1 plays a critical role in antioxidant mechanisms and preventing cellular dysfunction or death in DA neurons. 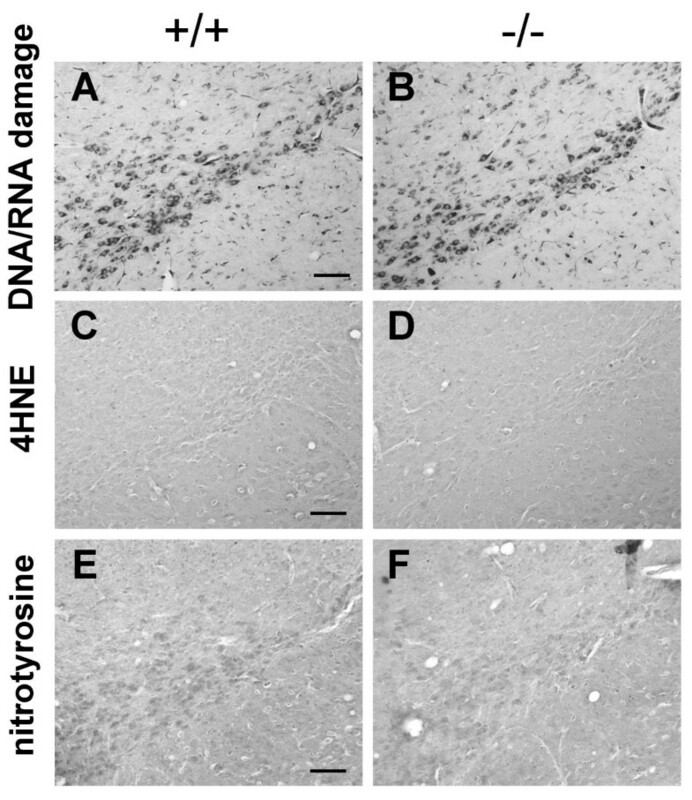 Consistent with this notion, DJ-1 deficiency induces an increased sensitivity to oxidative stimuli, including hydrogen peroxide, 6-hydroxydopamine, and 1-methyl-4-phenyl 1,2,3,6-tetrahydropyridine (MPTP), and overexpression DJ-1 protects neurons from various oxidative stimuli [5, 10, 22–25]. Furthermore, Drosophila DJ-1 mutants showed accumulation of ROS and are sensitive to oxidative stress including paraquat, rotenone or hydrogen peroxide [9, 26]. DJ-1-/- mice showed increased sensitivity to MPTP and oxidative stress . It however remains unclear whether DJ-1 deficiency would lead to accumulation of oxidative damage in aging mouse brains in the absence of environmental oxidative stressors. Our previous study showed that DJ-1-/- mice displayed hypoactivity in the open field at the age of 3 months . 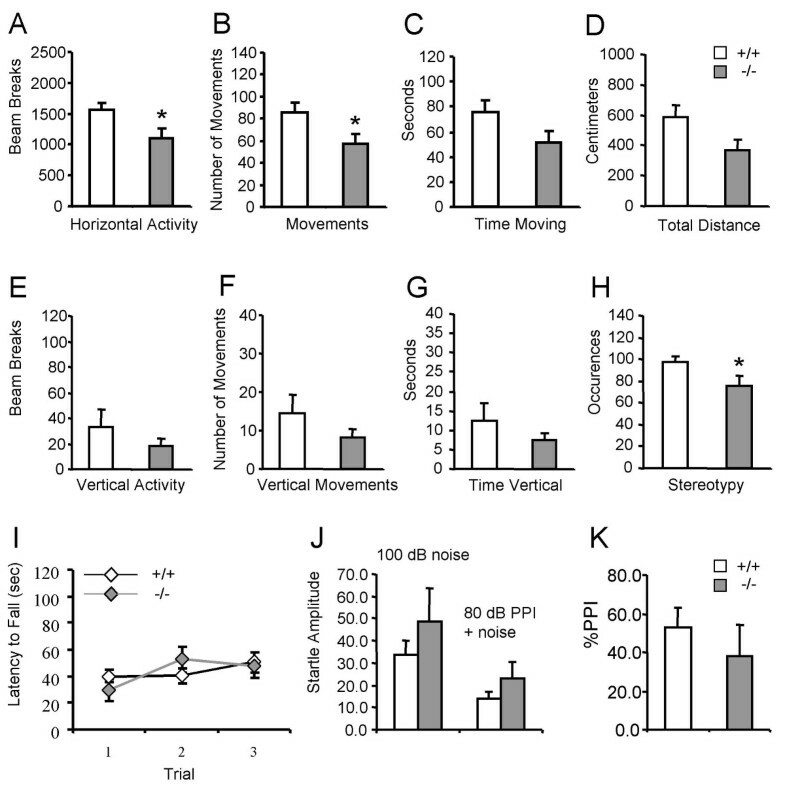 To examine whether aged DJ-1-/- mice display reduced locomotor activity, we assessed the locomotor abilities of aged DJ-1-/- mice using a battery of well-established behavioral tests. Recording of spontaneous, voluntary movements during 15 min in the open field test revealed a significant reduction in the horizontal activity and fewer instances of stereotyped behavior of DJ-1-/- mice (n = 15) compared to wild-type littermates (n = 17) at the age of 18–25 months (Fig. 1A–H). We also assessed involuntary movement using the rotarod and acoustic startle reflex paradigms. Rotarod test revealed that DJ-1-/- (n = 8) and wild-type littermate (n = 9) mice at the age of 22–25 months had similar latency before falling off the rotating rod during three independent trials (Fig. 1I). DJ-1-/- (n = 6) and control (n = 9) mice at the age of 22–25 months displayed similar acoustic startle reflex, measured by the force with which the mouse jumped in response to a pulse of loud noise (Fig. 1J). Acoustic startle response can be inhibited by a preceding weaker stimulus, a process termed prepulse inhibition (PPI), which is thought to be modulated by the central noradrenergic neurotransmission [27–29]. Aged DJ-1-/- mice displayed also normal PPI (Fig. 1K). Aged DJ-1 -/- mice exhibit reduced spontaneous activity in the open field. (A-H) Evaluation of DJ-1-/- mice and wild-type controls at the age of 18–25 months (+/+: n = 17, -/-: n = 15) in the open field for 15 min. Two arrays measured horizontal movements (A-D), and one array measured vertical movements (rearing on hind legs) (E-G). Repeated sequential breakings of the same beam are scored as occurrences of stereotyped behaviors (scratching, grooming, etc.) (H). DJ-1-/- mice show significantly reduced horizontal activity, horizontal movements and stereotypy (p < 0.05). (I) DJ-1-/- and wild-type control mice at the age of 22–25 months show similar latencies to fall off an accelerating rotating rod during 3 trials (+/+: n = 9, -/-: n = 8, p > 0.05). (J and K) DJ-1-/- and wild-type mice at the age of 22–25 months show similar acoustic startle responses to 100 dB noise alone (+/+: 33.5 ± 6.7, n = 9, -/-: 48.5 ± 15.1, n = 6, p > 0.05), 100 dB noise with 80 dB PPI (+/+: 13.7 ± 3.1, n = 9, -/-: 22.8 ± 7.5, n = 6, p > 0.05) and %PPI (+/+: 52.9 ± 9.9, n = 9, -/-: 38.2 ± 16.1, n = 6, p > 0.05). Data in all panels are expressed as mean ± SEM. Asterisk denotes statistical significance (*p < 0.05). To investigate the consequence of DJ-1 inactivation and aging on the survival of DA neurons, we performed quantitative histological analysis on DJ-1-/- mice at the age of 24–27 months. Immunohistochemical analysis of DJ-1-/- mice using an antibody against DJ-1 confirmed the absence of DJ-1 protein in the brain of DJ-1-/- mice (Fig. 2A, B). Nissl staining revealed normal brain morphology in aged DJ-1-/- mice (data not shown). 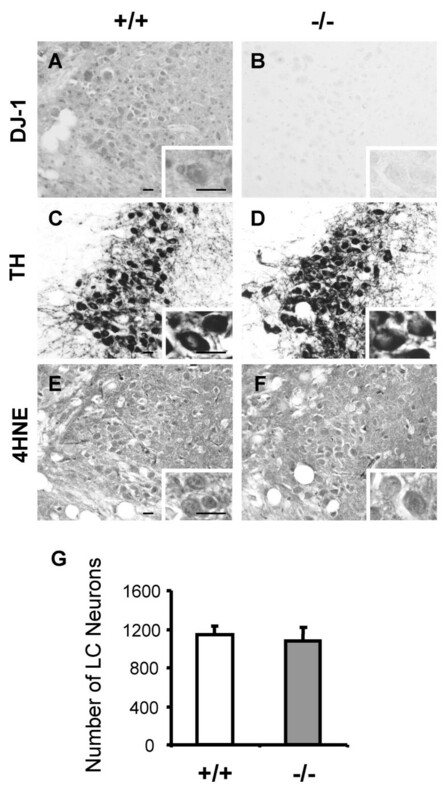 Though the most prominent neuropathological feature of PD is the selective loss of DA neurons in the substantia nigra (SN), immunohistochemical analysis of aged DJ-1-/- mice using an antibody specific for tyrosine hydroxylase (TH) revealed normal TH staining in the SN and normal morphology of DA neurons at the age of 24–27 months (Fig. 2C–F). Quantification of the number of DA neurons in the SN of DJ-1-/- (n = 4) and control mice (n = 4) using unbiased stereological methods revealed similar numbers of TH-positive neurons in the SN of DJ-1-/- and wild-type mice (+/+: 10140 ± 812, -/-: 9960 ± 972, n = 4 per genotype, p > 0.05) (Fig. 2K). Since DJ-1 protein is also present in astrocytes [30, 31], and increased glial fibrillary acidic protein (GFAP) immunoreactivity is a good marker for inflammatory responses and neurodegeneration, we also performed GFAP immunostaining. No difference in GFAP immunoreactivity and morphology of astrocytes was detected in the SN between DJ-1-/- and wild-type mice (Fig. 2G–J). These findings indicate that there is no DA neuronal degeneration in DJ-1-/- mice during the life span of mice. No DA neuron loss in the SN in aged DJ-1 -/- mice. (A and B) The lack of the expression of DJ-1 protein in the SN in DJ-1-/- mice is indicated by the presence of DJ-1 immunoreactivity in the SN of wild-type controls and the absence of DJ-1 immunoreactivity in DJ-1-/- mice. (C-F) Normal morphology of DA neurons in aged DJ-1-/- mice is indicated by similar TH staining in the SN of DJ-1-/- mice and wild-type controls at the age of 24–27 months. Panels (E, F) indicate enlarged view of panels (C, D), respectively. (G-J) Similar GFAP staining in the SN of DJ-1-/- mice and wild-type controls suggesting that there is no inflammatory or neurodegenerative changes in the SN of DJ-1-/- mice. Panels (I, J) indicate enlarged view of panels (G, H), respectively. Scale bars; A-J, 0.1 mm. (K) Similar numbers of TH-positive neurons are present in the SN of DJ-1-/- and wild-type mice at the age of 24–27 months (+/+: 10140 ± 812, -/-: 9960 ± 972, n = 4 per genotype, p > 0.05). All data are expressed as mean ± SEM. Since DA neurons in the SN project processes to the striatum, we next examined the striatum. Immunohistochemical studies confirmed the absence of DJ-1 protein in the striatum of DJ-1-/- mice (Fig. 3A, B) and there was no significant difference in TH staining of DA nerve terminals in the striatum (Fig. 3C, D). Furthermore, there was no difference in GFAP immunoreactivity in the striatum between DJ-1-/- and control mice (Fig. 3E–H). 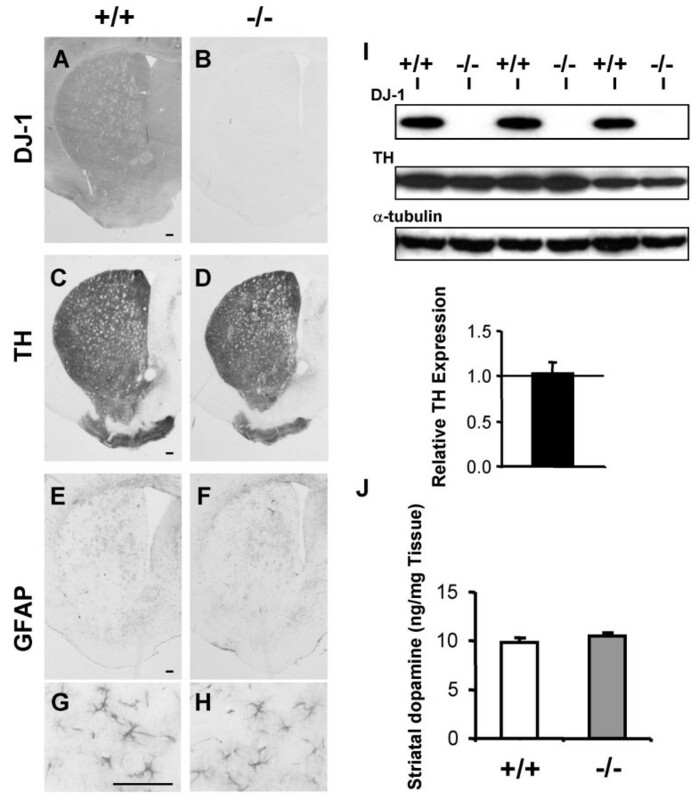 Western analysis also showed unchanged levels of TH protein in the DJ-1-/- brain (Fig. 3I). HPLC analysis revealed that striatal levels of dopamine and its major metabolites, dihydroxyphenylacetic acid (DOPAC) and homovanillic acid (HVA) are similar between DJ-1-/- and control mice at the age of 24–27 months (Fig. 3J) (dopamine: +/+; 9.8 ± 0.6 ng/mg, n = 7, -/-; 10.5 ± 0.4 ng/mg, n = 5, p > 0.05; DOPAC: +/+; 2.0 ± 0.1 ng/mg, n = 7, -/-; 2.0 ± 0.2 ng/mg, n = 5, p > 0.05; HVA: +/+; 1.4 ± 0.2 ng/mg, n = 7, -/-; 1.2 ± 0.1 ng/mg, n = 5, p > 0.05). These findings indicate that levels of striatal dopamine are unchanged in DJ-1-/- mice during the life span of mice. No DA neuron terminal loss and normal dopamine content in the striatum in aged DJ-1 -/- mice. (A and B) The absence of the expression of DJ-1 protein in the striatum in DJ-1-/- mice is indicated by the presence of DJ-1 immunoreactivity in the striatum of wild-type controls and the absence of the immunoreactivity in DJ-1-/- mice. (C and D) Similar TH staining in the striatum of DJ-1-/- mice and wild-type controls at the age of 18–19 months indicating no DA neuron terminal loss in DJ-1-/- mice. (E-H) Similar GFAP staining in the striatum of DJ-1-/- mice and wild-type controls suggesting that there is no inflammatory or neurodegenerative changes in DJ-1-/- mice. Panels (G, H) indicate enlarged view of panels (E, F), respectively. Scale bars; A-H, 0.1 mm. (I) Western analysis of DJ-1, TH, and α-tubulin proteins in the striatum of aged DJ-1-/- brains and wild-type controls at the age of 18–20 months. The value is normalized to that of α-tubulin. The level of TH proteins in brains of wild-type mice is set at 1.00 (TH: -/-; 1.03 ± 0.12, p > 0.05) (n = 4 per genotype). (J) Similar striatal content of dopamine in DJ-1-/- mice and wild-type controls at the age of 24–27 months (+/+: 9.8 ± 0.6, n = 7, -/-: 10.5 ± 0.4, n = 5, p > 0.05). All data are expressed as mean ± SEM. Lewy bodies are protein aggregates containing α-synuclein and ubiquitin and are considered a pathological hallmark of PD. Therefore, we examined DJ-1-/- brains for deposits of α-synuclein and ubiquitin. Immunohistochemical analysis of DJ-1-/- brains using antibodies specific for α-synuclein and ubiquitin showed no inclusions in any brain sub-regions, including the SN at the age of 24–27 months (data not shown). Oxidative damage is thought to contribute to the degeneration of DA neurons in PD . DJ-1 is thought to play a role in anti-oxidative stress by scavenging ROS. It has been reported that oxidative DNA or RNA damage, such as 8-oxoguanine, accumulates in the SN in both PD patients and mouse models [32, 33]. Several lipid peroxides, especially 4-hydroxy-2-nonenal (4HNE), are highly reactive, avidly form adducts with many proteins and have been detected in Lewy bodies . Lewy bodies are also immunoreactive for 3-nitrotyrosine, an index of protein damage by ROS . Immunohistochemical analysis of DJ-1-/- brains using these oxidative stress markers revealed there was no significant increase in these immunoreactivities in the SN at the age of 24–27 months (Fig. 4A–F), indicating that there is no accumulation of oxidative damage in aged DJ-1-/- brains. No increased oxidative damage in the brains of DJ-1 -/- mice. (A and B) Similar staining of DNA and RNA oxidative damage in the SN of DJ-1-/- mice and wild-type controls at the age of 24–27 months showing no abnormal accumulation of DNA and RNA oxidative damage in aged DJ-1-/- mice. (C and D) Similar 4HNE staining in the SN of DJ-1-/- mice and wild-type controls showing no abnormal accumulation of lipid peroxidation products in aged DJ-1-/- mice. (E and F) Similar nitrotyrosine staining in the SN of DJ-1-/- mice and wild-type controls showing no abnormal accumulation of oxidative protein damage in aged DJ-1-/- mice. Scale bars; A-F, 0.1 mm. In addition to DA degeneration, brains of PD patients also show degeneration of noradrenergic neurons in the locus coeruleus (LC). It was reported that parkin-deficient mice have a loss of catecholaminergic neurons in the LC . Therefore, we examined whether aged DJ-1-/- mice would exhibit loss of noradrenergic neurons in the LC. Immunohistochemical analysis showed substantial levels of DJ-1 in the LC of wild-type mice (Fig. 5A, B). TH staining revealed normal morphology of noradrenergic neurons in the LC of DJ-1-/- mice at the age of 24–27 months (Fig. 5C, D). Immunohistochemical analysis using antibodies specific for α-synuclein and ubiquitin showed no inclusions in noradrenergic neurons (data not shown). 4HNE staining revealed that there was no significant difference in the immunoreactivity between DJ-1-/- mice and wild-type controls (Fig. 5E, F). The TH-positive noradrenergic neurons were counted in sections spanning the rostral-caudal extent of the nucleus at the age of 24–27 months. There was no significant difference in the total number of TH-positive noradrenergic neurons in the LC between DJ-1-/- mice and wild-type controls (+/+: 1145 ± 87, -/-: 1073 ± 151, p > 0.05; n = 8 per genotype; Fig. 5G). These findings indicate that there is no noradrenergic neuron loss in the LC of aged DJ-1-/- mice. Normal morphology of noradrenergic neuron and no noradrenergic neuron loss in LC in aged DJ-1 -/- mice. (A and B) A substantial level of expression of DJ-1 in LC in control mice is indicated by the presence of DJ-1 immunoreactivity in the LC of wild-type controls and the absence of the immunoreactivity in DJ-1-/- mice. Any immunoreactivity in DJ-1-/- mice indicates non-specific staining. (C and D) Similar TH staining in the LC of DJ-1-/- mice and wild-type controls showing normal morphology of noradrenergic neurons in LC in aged DJ-1-/- mice at the age of 24–27 months. (E and F) Similar 4HNE staining in the LC of DJ-1-/- mice and wild-type controls showing no abnormal accumulation of lipid peroxidation products in aged DJ-1-/- mice. Insets in panels indicate enlarged view of each section. Scale bars; A-F, 0.02 mm; insets, 0.02 mm. (G) The total numbers of TH-positive LC neurons of both sides in all sections from rostral to caudal showing similar numbers of TH-positive neurons in the LC of DJ-1-/- mice and wild-type controls at the age of 24–27 months (+/+: 1145 ± 87, -/-: 1073 ± 151, p > 0.05) (n = 8 per genotype). All data are expressed as mean ± SEM. Mutations in parkin (PARK2), PINK1 (PARK6), and DJ-1 (PARK7) are associated with autosomal recessive PD, in which loss of function of each of these gene products leads to degeneration of DA neurons and clinical manifestations of PD. We previously reported that DJ-1-/- mice display significant motor abnormalities and nigrostriatal DA functional deficits, though the number and morphology of DA neurons are normal up to the age of 12 months . Since aging is a major risk factor for PD, we analyzed older DJ-1-/- mice to determine whether aged DJ-1-/- mice developed PD-like pathology, such as degeneration of nigrostriatal DA neurons in the SN or noradrenergic neurons in the LC. Our quantitative analysis failed to detect any significant loss of DA neurons or noradrenergic neurons in aged DJ-1-/- mice at 24–27 months. We found that levels of striatal dopamine and its metabolites were normal. Additionally, there were no other neuropathological changes such as gliosis or protein aggregation in aged DJ-1-/- brains. Furthermore, we found no accumulation of oxidative damage in aged DJ-1-/- brains. Despite the fact that multiple important functions associated with the pathogenesis of PD have been attributed to DJ-1, surprisingly, we found that loss of DJ-1 function in mice even at the age of 2 years did not cause significant loss of DA neurons. First, DJ-1 has been reported to function as an anti-oxidative stress agent through scavenging ROS [5–7]. However, we failed to find increases in immunoreactivities of oxidative damage markers in DJ-1-/- brains at the age of 24–27 months, suggesting the lack of accumulation of ROS in aged DJ-1-/- brains. It has been reported that expression of DJ-1 is induced in cells that have been subjected to oxidative stresses . Therefore, it is possible that DJ-1 plays a critical role in an environment with elevated oxidative stress; however, under normal conditions, DJ-1 is not required for nigral neuron survival. To examine whether DJ-1-/- mice have increased susceptibility to oxidative stress under oxidative conditions is an important question to be addressed in future studies. Second, it was reported that DJ-1 had chaperone activity and inhibited α-synuclein aggregation . Immunohistochemical studies in aged DJ-1-/- mice did not show any inclusions immunoreactive for α-synuclein or ubiquitin, indicating that loss of DJ-1 function is not enough to result in formation of these protein inclusions. It has been reported that these inclusions have been found in animal models treated with oxidative stimuli such as rotenone or MPTP [37, 38] and that the chaperone activity of DJ-1 can be stimulated by oxidation . Therefore, investigation of whether DJ-1 inactivation would accelerate protein aggregation under conditions of oxidative stimuli is necessary to understand the role of DJ-1 in chaperone activity and formation of Lewy bodies. Third, it has been suggested that DJ-1 might be involved in transcriptional regulation. DJ-1 transcriptionally up-regulates human TH by inhibiting the sumoylation of pyrimidine tract-binding protein-associated splicing factor (PSF) . We however failed to detect reduced TH expression in DJ-1-/- mice even at the age of 2 years indicating that DJ-1 is not required in the transcriptional regulation of TH expression in mice. In summary, despite the fact that loss of function mutations in DJ-1 cause PD and presumably nigral degeneration in humans, our current study failed to find DA neurodegeneration in DJ-1-/- mice during the life span of mice. In addition, although DJ-1 has been shown to protect cells from environmental oxidative stimuli, absence of DJ-1 did not cause accumulation of oxidative damage in aged DJ-1-/- mice under normal conditions. These results are consistent with our prior report showing that loss of parkin function alone in mice is also insufficient to cause loss of DA neurons up to the age of 2 years . Other possibilities, including shorter life span of mice, well-controlled mouse housing environment, may contribute to the absence of profound nigral degeneration that is characteristic of PD brains. Open field: Male DJ-1-/- mice and wild-type littermates were tested in the open field using two acrylic animal cages. Each pair of both genotypic groups were placed into two cages at a time for 15 min during which their horizontal and vertical movements were monitored using 3 arrays of 16 infrared light beam sensors (AccuScan Instruments). The total number of movements, the distance traveled, the time spent moving and the total number of infrared beam breaks in both the horizontal plane and along the vertical axis were recorded and analyzed using AccuScan VersaMax software. Statistical differences between the two genotypes were assessed by Student's t-test. Rotarod: Male DJ-1-/- mice and wild-type littermates were also tested on the rotarod. Two pairs of both genotypic groups were placed at one time on the Economex accelerating rotarod (Columbus Instruments) equipped with individual timers for each mouse. Mice were initially trained to stay on the rod for 2 min at a constant rotation speed of 5 rpm. After a 2 min rest, mice were returned to the rotating rod at an accelerating speed of 0.2 rpm/sec, and the time of the mice remaining on the rotating rod was measured as latency to fall. A total of 3 trials were performed for each mouse. Acoustic Startle Reflex: Noise and prepulse generation were controlled by a computer. Each pair of both genotypic groups were placed in the two calibrated startle cylinders (Med Associates) and received a 5-min acclimation period without background noise before the startle stimuli. The testing session contained 50 trials and lasted 25 minutes, which consisted of twenty five pulses at 100 dB alone or twenty five 100 dB pulses preceded (100 ms) by prepulses of 80 dB in a semi-random order with a 30-second interval. The stimulation duration was 600 ms, while the duration of 100 dB pulses was 50 ms at frequencies of 5–40 kHz and the duration of the prepulses at 80 dB was 10 ms at a frequency of 10 kHz. Their responses were measured with a transducer that was attached to the underside of the platform and connected to the computer. Averages of peak values resulting from 100 dB pulses alone or 100 dB pulses coupled with 80 dB prepulses were calculated. %PPI was calculated using the following formula; 100 – (startle amplitude with PPI/startle amplitude alone) × 100. The data was evaluated with Student's t-test. Mouse brains were dissected, formalin fixed for 2 h, processed for paraffin embedding, and sectioned in the coronal plane at 16 μm or 20 μm thickness. Each paraffin block contained 4 DJ-1-/- and 4 wild-type brains. Deparaffinized sections were immersed in a solution of 3% H2O2/methanol for 15 min. The sections were incubated in 10% normal goat serum (NGS)/phosphate buffered saline (PBS) for 1 h, and then were incubated with each appropriately diluted primary antibodies against DJ-1 (rabbit polyclonal; Signet), tyrosine hydroxylase (TH) (rabbit polyclonal; Chemicon), glial fibrillary acidic protein (GFAP) (mouse monoclonal; Sigma), α-synuclein (Syn-1; mouse monoclonal; BD Transduction Labs. ), ubiquitin (rabbit polyclonal, DAKO), Michael adducts of 4HNE (rabbit polyclonal, Calbiochem), nitrotyrosine (rabbit polyclonal, Upstate) or DNA/RNA oxidative damage (mouse monoclonal, QED Bioscience) in 10% NGS/PBS at 4°C overnight. Rinsed sections were processed by Vectastain ABC kit (Vector Labs.) with the correct biotinylated secondary antibody, and the peroxidase reaction product was detected using DAB peroxidase substrate (Vector Labs.). The number of DA neurons in the SN was determined by counting TH immunoreactive neurons in coronal sections of four brains per genotype using the fractionator and optical dissector methods of unbiased stereology  under a Leica DMRB microscope equipped with a CCD camera connected to a computer running Bioquant image analysis software. The counting of the number of TH-positive cells in LC was performed by counting the cells in every 4 coronal sections (16 μm thickness) from the rostralmost to caudalmost limits of the LC [42, 43]. A TH-positive cell was defined as an immunoreactive somata with a clearly visible unstained nucleus, or a piece of a soma of comparable size. The cells were counted bilaterally in all sections per animal with a power (200X) using a light microscope. The total number of TH-positive LC neurons per animal was calculated by summing the bilateral TH-positive LC neurons in all sections from rostral to caudal. The experimenter was blind to the genotypes of mice. Values are reported as means ± SEM. Statistical differences were assessed by Student's t test. Striata were dissected, weighed and stored at -80°C. Frozen striata were sonicated in ice-cold solution (0.1 N perchloric acid, 0.2 mM sodium bisulfite) and centrifuged for 20 min at 20,000 × g at 4°C. For dopamine measurement, the supernatant was filtered (0.2 μm) and applied to a C18 reverse phase HPLC column connected to an ESA model 5200A electrochemical detector with a 5014B microdialysis cell with potentials set to -175 mV and +200 mV using MD-TM mobile phase (ESA, Inc.) with isocratic elution. For metabolites measurement, the supernatant was applied to a 150 × 2.1 mm ID, C18 reverse phase HPLC column connected to an Alexys LC-100 system (Antec-Leyden) with electrochemical detection (DECADE II) and a VT-03 electrochemical flow cell using a detection potential of 590 mV and isocratic elution (50 mM phosphoric acid, 50 mM citric acid, 400 mg/ml OSA, 0.1 mM EDTA, 8 mM KCl, pH 3.75, 3% methanol) flowing at 0.2 ml/min. The dorsal striata were dissected out and sonicated in 500 μL of 150 mM NaCl, 50 mM Tris, pH 7.4, 2 mM EDTA, 1% Nonidet P-40, 1% sodiumdeoxycholate, 1% sodium dodecylsulfate, protease inhibitors (Roche) and phosphatase inhibitors (Calbiochem). The protein content was analyzed by BCA assay (Pierce), and 10 μg of protein per lane was resolved on 4–12% gradient gels (Invitrogen), transferred to nitrocellulose membrane, blocked with 5% milk in TBST (50 mM Tris, pH 7.4, 150 mM NaCl, 0.1% Tween-20), and incubated with a primary antibody (TH, Chemicon) at 4°C overnight. The membrane was then incubated with a peroxidase-conjugated anti-rabbit antibody (Biorad), treated with chemiluminescence reagent (PerkinElmer Life Sciences) and exposed to film. Sample was reprobed with a primary antibody against α-tubulin (mouse monoclonal; Sigma) to confirm equal protein loading. We thank Tohru Kitada, Laura Corina and Lan Wang for assistance. This work was supported by grants from the NINDS (R01NS052745) and the Michael J. Fox Foundation. HY and JS designed the experiments and wrote the paper; HY performed all of the experiments. All authors read and approved the final manuscript.